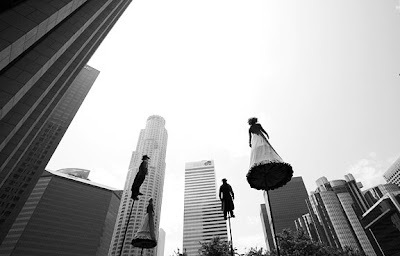 The Australian performance art dance troupe, Strange Fruit, held several performances in downtown LA this week. They performed their piece "Swoon" which is a shorter version of their piece "The Field." The Melbourne based group performs their work atop 13 foot tall poles that sway in every direction. They will be in downtown LA Friday and Saturday at 7th and Fig with shows at 11:30 a.m., 12:30 p.m., and 1:30 p.m. The shows are free to the public and are worth checking out.